The first piece is about the U.S. air attack last nights against various targets in east Syria. The second piece right next to it explains that such strikes in Iraq have had little effect. The juxtaposition demonstrates the futility of today's bombing campaign, part of the ongoing wars of proxy in Syria. As a result the Islamic State will only gain further legitimacy. The U.S. and some "coalition" of Arab dictatorships bombed various targets related to the Islamic State in east Syria. The Syrian government was informed about the attack and did not overly protest against it. The U.S. did not attack IS positions around the northern Syrian city Kobane where the IS is fighting against Kurdish militia in an attempt to open up a new logistic path for the IS to Turkey. Agreeing to this new logistic path was probably part of the price Turkey paid for recently getting its diplomats freed from IS internment. The U.S. alone additionally bombed a target related to one specific part of Jabhat al-Nusra in north west Syria. It claims that it hit the "Khorasan group". But that groups is just a Pentagon FUD invention. It is nothing but the a segment of the long established leadership group of al Nusra. While ISIS had prepared for the announced U.S. air attacks and dispersed its personal and material Jabhat al-Nusra was unprepared and lost some 50 of its fighters. One of the Nusra leaders, Mohsen al-Fadli al-Kuwaiti, was killed in this attack. Also today the Syrian airforce wanted to bomb Jabhat al-Nusra positions in the Golan heights where Nusra is, as first reported here, opening a corridor from Jordan towards Lebanon and for attacks on Damascus right along the demarcation line between Israel and Syria. Israel, in quite open support effort for the Nusra plan, shot down the Syrian SU-24 using U.S. provided Patriot missiles. While Israel claims that the plane violated its border the reported crash site was far from the border near Kanaker, Syria which is halfway between the demarcation line and Damascus. Under the protection of the U.S. attack on IS and other targets Israel now practically established a no-fly-zone next to the Golan which will allow Jabhat al-Nusra to safely use the corridor and to attack Hizbullah in Qalamoun and in south Lebanon. It also opens space for new attacks on Damascus. 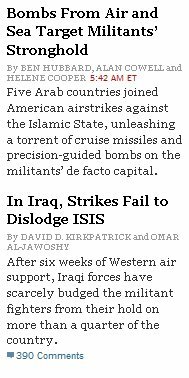 The U.S. attack on the IS in Syria will, as the NYT headlines express, have as little effect as such attacks have in Iraq. Without coordinating air attacks with a capable, available ground force like the Syrian army such strikes on IS will make no conceivable difference. I have yet to see any report that the U.S. planes have hit some of the major weapons or ammunition depots the IS captured from the Iraqi army. There are some 50 main battle tanks and lots of heavy artillery pieces in the hands of IS. What is done to disable those?